Paleo Deep Dish Double Chocolate Chunk Brownies made with all gluten-free, grain-free and dairy-free ingredients for an epic brownie recipe! Some crave deep dish pizza, and some crave a big deep dish PALEO BROWNIE! Right now (and usually) I choose the later. Especially now that this Paleo Deep Dish Double Chocolate Chunk Brownie recipe is finally here and on the blog! With so many of us having holiday entertaining and parties to go to, it can be overwhelming and stressful trying to find the “perfect” dessert recipe to bring with you. I obviously think any dessert from the blog to whip up but if you really want something that will freak out your chocolate lovers and have everyone swooning, this recipe is calling your name. Brownies are the best no matter which way you slice it, but when they are double the thickness and double the amount of chocolate as your usual brownie, they tend to overpower other recipes. 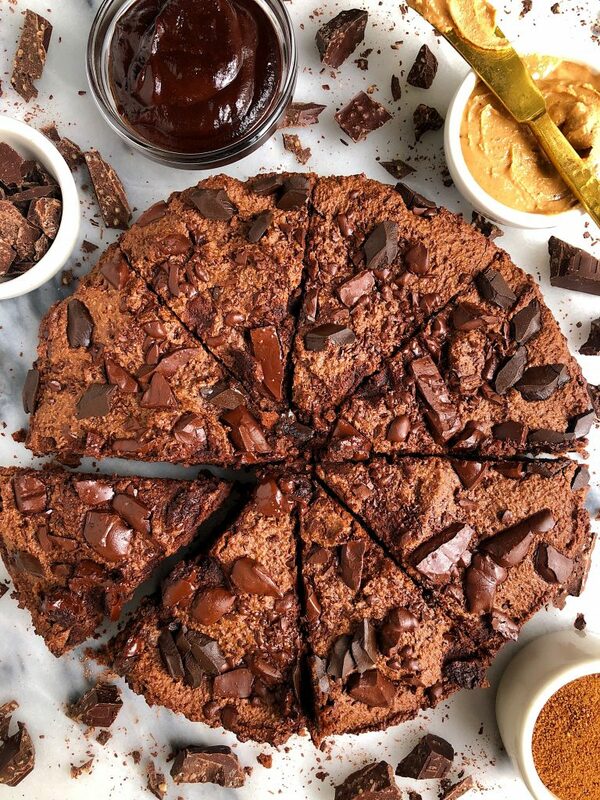 This Paleo Deep Dish Double Chocolate Chunk Brownie is made with simple ingredients like coconut oil, unsweetened applesauce, almond flour and has zero refined sugars in it. I use coconut sugar in the mix and for the chocolate, we are baking with Hu Kitchen’s dark chocolate bars (duh). My go-to refined sugar-free option always. And you can really use any of their flavors in this. I personally think the Salty Dark Chocolate is best in this recipe to keep things simple, but if you have the Cashew Butter & Vanilla Bean on hand – go for it! It will taste delicious. By now you know about my love affair and obsession for Hu Kitchen. 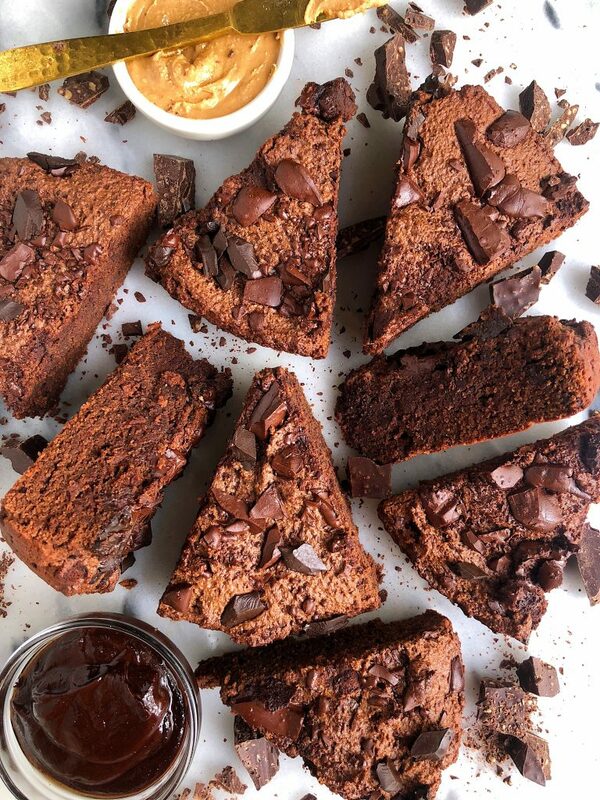 We have made a few different recipes with their dark chocolate on the blog and that brownie bread from September? Ya, that pretty much shut down the blog for the night because everyone was going as crazy as I was after tasting it! Don’t forget to share your Paleo Deep Dish Double Chocolate Chunk Brownie with me on Instagram when you bake it. 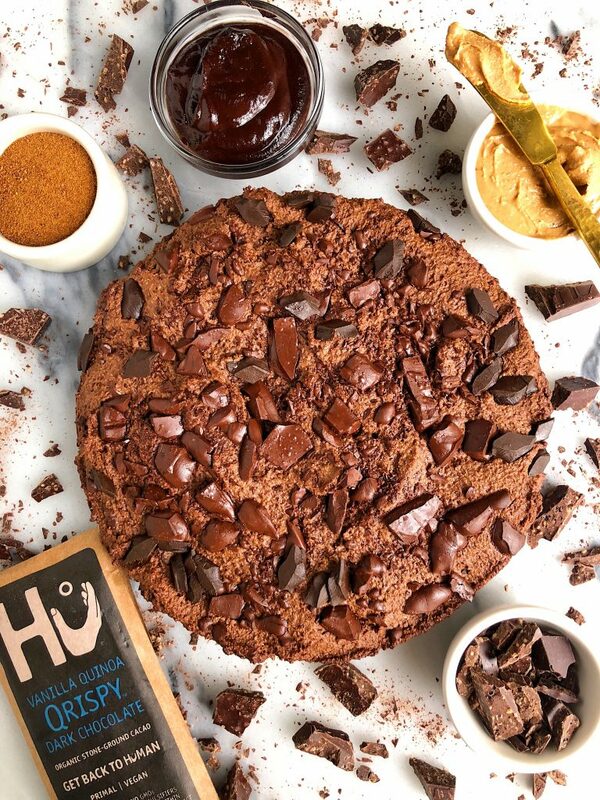 And incase you are craving some more Hu goodness, check out these recipes: Paleo Pumpkin Chocolate Chunk Cookie Cake, Paleo Dark Chocolate Brownie Bread and The Best Chocolate Sheet Cake.